The only media buying platform that puts native advertising strategies on autopilot. Maximus puts your native advertising strategies on autopilot. Launch and manage campaigns across all major advertising networks, then track links, clicks, and conversions right on the platform using Maximus’ tracking capabilities or one of the softwares it supports. Maintain a goal margin by adjusting bids up or down. Never stop a winning campaign because of a budget issue. 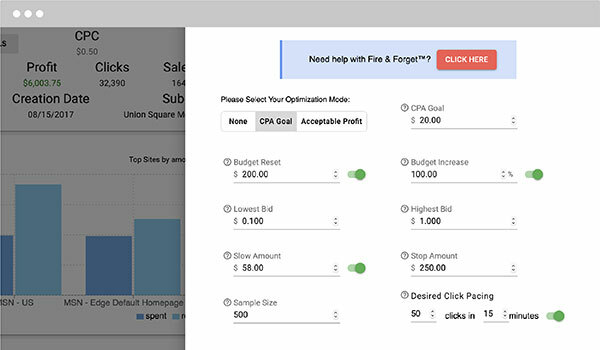 Scale campaigns with features like budget increase, cloning, and site-level bidding. You set your budget and goals and Maximus automatically scales to meet them. 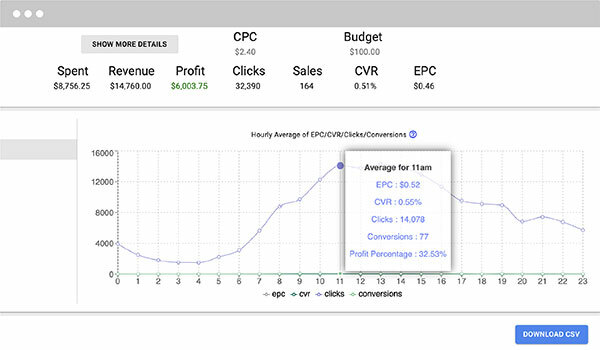 Auto-optimize your campaigns to maximize your ROI. 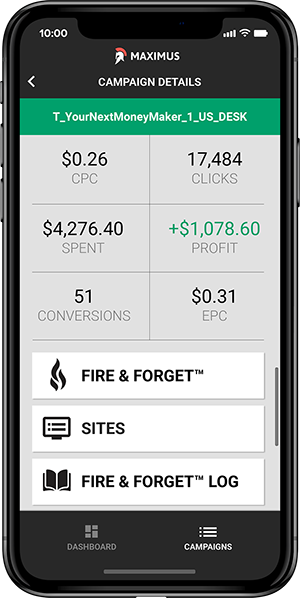 Maximus’s patent-pending Fire & Forget™ technology allows users to set parameters and optimize campaigns to increase ROI. 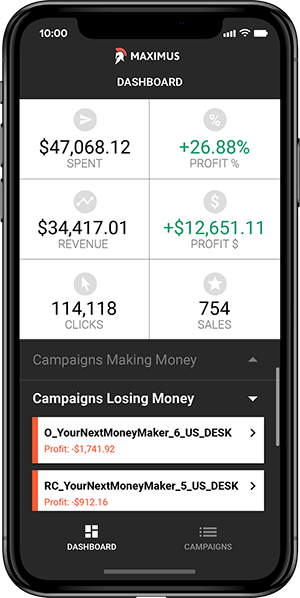 Automatically increase your budget so winning campaigns don’t stop and set limits to minimize loss. Maximus streams ad cost and revenue in real time. 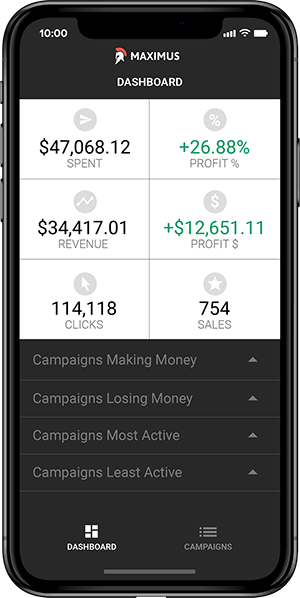 Keep track of your campaign performance in real time. 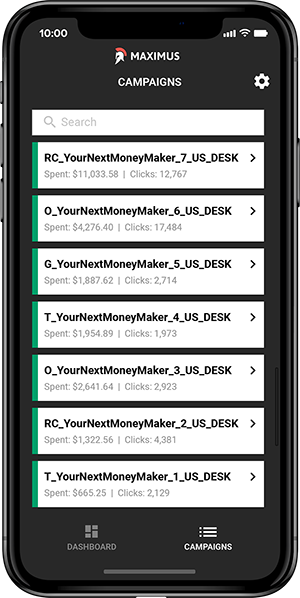 Unlike other networks which may be delayed, Maximus streams ad cost and revenue in real time so you can make better decisions about your campaigns. 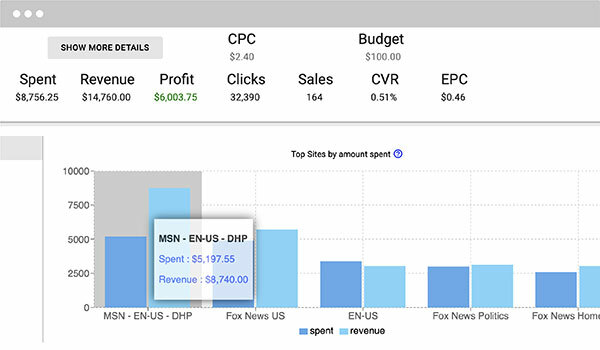 Real-time, comprehensive reporting provides invaluable insight into your campaigns. Maximus goes where you go with a companion app. Complement your desktop experience by downloading the Maximus iOS mobile app and manage campaigns, check campaign performance, and make adjustments wherever you are. We want our users to have the absolute best possible experience on our platform, which is why we take customer service and client support so seriously. In addition to dedicated account managers and client success managers, help is available 24/7 through our Live Chat support. Simply click "Support" at the top of every page. Maximus offers full API and Webhook support. Integrate the services you already use and streamline them to a single platform. Don't miss out on revenue because of unreliable software. With 99.9% uptime, Maximus is built with high-reliability cloud architecture to handle your highest-volume campaigns. Maximus is also fully cloud-based and runs on Amazon Web Services. All-in-all it’s a slick tool that can eliminate a ton of bidding labor. 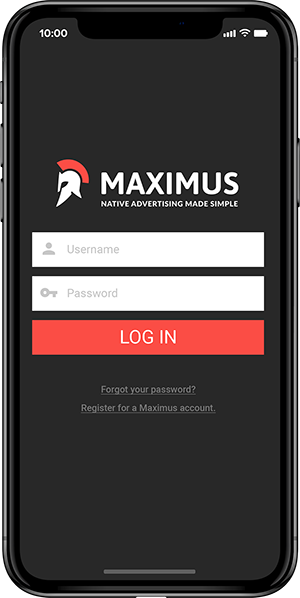 We built an ad manager on top of our internal analytics platform last year to help us execute bids more easily…But you guys seemingly had already built it with Maximus at an affordable price.